This is the last of a three-part series exploring Zwift racing’s challenges and opportunities. Part one focused on spectating, part two on broadcasting, and part three on the actual race participants. Today, in the final post of this series, we continue part 3 by taking a look at the actual in-game experience for Zwift racers–things like teamwork, pack dynamics, race visuals, etc. What’s working, what isn’t, and how do we fix it? Higher pack speeds: riders are essentially taking very short rotations at the front, and the pack is pulled along at the speed of the fastest rider. Difficulty executing typical race strategy: many race strategies involve staying off the front entirely, or staying on the front to force a pace. Since it is difficult to maintain a particular pack position, these strategies are difficult to execute. Could Zwift implement a “draft feel” feature, where your smart trainer’s resistance gets bumped up to indicate that you are in the wind? This may make pack positioning more intuitive and realistic. There has also been talk of implementing some sort of steering mechanism. This was actually part of the original game Jon Mayfield created, but was scrapped to keep the interface and experience simple and easy. I’m not sure I want to hassle with using some sort of steering controls while Zwifting, but if my phone could sense the tilt of my bike (which is on a rocker plate) I could easily steer with it. The double draft is more realistic than Zwift’s “standard” draft algorithm, but it has a fatal flaw: packs move too fast. When you are saving even more power in the draft, and that is coupled with the front churning (see above), you end up with pack speeds which are (in my experience) 2-3 miles per hour higher than they should be. What’s the result? Well, entire groups get coned in races as we saw in the KISS Community League Richmond race a couple months ago (this is an obvious red flag telling us double draft pack speeds are too high.) But more importantly, it results in a lack of attacks because riders know they can’t stay away from the hard-charging pack for any significant amount of time. If Zwift could slow the packs in double draft races we would get more animated events. Riders could sit in the draft to conserve energy, then attack and possibly stay away. How could Zwift slow down the pack? That’s a question for the programmers! If you’ve bombed down Alpe du Zwift or even raced London’s Classique route you know our avatars take corners at unrealistically high speeds. Not only does this make your head swim at 55mph, it also makes the game feel less realistic and makes races more TT-like and less animated. If riders automatically slowed heading into a corner, races would immediately become more animated. Just like outdoor crits, a hard short effort would follow each tight corner as riders worked to get back up to speed. Certainly, some sort of “auto-braking” could be employed to make this happen. Some riders complain that Zwift racing is just a power contest. Obviously, this is an over-simplification: recent KISS Super League pro races pitting pro riders against experienced Zwifters showed us that experience on the platform is a major factor when it comes to winning. Even knowing which frame and wheelset to use for a particular course gives more knowledgeable riders a distinct advantage. That said, the complaint holds a bit of truth: Zwift does lack many of the variables found in outdoor racing. This results in more predictable races and, perhaps, a less engaging experience overall. Modifying pack dynamics (discussed above) would be some help, but even more could be done to make Zwift races less TT-like. Zwift is currently testing an event mode which always gives “useful” powerups (aero helmet, feather, van) at arches, giving racers more opportunities to strategically use a powerup. This is a step in the right direction. What else could be done? Zwift could introduce new powerups just for racing. Perhaps a Ninja powerup where a rider disappears for 15 seconds, or if auto-braking in corners is implemented, a “sticky tires” powerup that lets you maintain more speed through the corner. We could also increase the number of powerups given. What if you could qualify for a powerup by putting in a hard effort? Maybe a breakaway off the front would give you a powerup, or a PR on a particular stretch of road (much like Alpe du Zwift works currently), or closing the gap to a group up the road, or setting a new 5-minute critical power PR. Other randomness could also be introduced. One obvious idea is wind. Outdoors, attacking into a crosswind is usually the best plan, while attacking with a strong tailwind or headwind is less useful. In a game, of course, anything is possible: the sloth could reach down and scratch random riders, slowing them down for a short time. Rain could cause wheel-sucking mud to form, or increase the level of auto-braking into corners. Rock slides could slow the pack. As long as race organizers can choose the level of random wackiness allowed in their events, why not create more options? No matter how strong of a rider you are, most of your Zwift racing experience will be you, alone, in your pain cave without spectators to cheer you on. For some Zwifters may not be much of a change from their outdoor racing experience at nearly abandoned office parks. But if we’re looking to bring pros onto the platform we need a way to inject some of that spectator excitement into their experience. Plus, wouldn’t it be motivating and exciting to have others cheering you on, even as a lower-category racer? Zwift racers who want to take the platform seriously have been streaming for years, building an audience of fans. This will continue to grow as Zwift racing becomes more popular, but I hope to see racer streams somehow integrated into the game so spectators can easily watch live video of riders. Live-streaming your race provides an added level of motivation in itself, knowing others are watching your race effort. Allowing some level of spectator interaction would also help motivate racers. Currently, spectators can give a racer a Ride On, but that’s it–and it’s not very easy to do! Zwift could start by making the Ride On process easy for spectators, but even more could be done. Why not allow spectators to private message a rider, send audible encouragement (Hammer time!) and more? Lastly: we’ve got virtual spectators on the streets of London and NYC. Why not build some race-specific blocks of rabid fans who light smoke bombs on our way up the Watopia KOM, or scream their lungs out in the final sprints? Cycling is a team sport, and Zwift is a social platform. So it’s no surprise that teams have been active in Zwift races since the early days. And yet, everyone knows team dynamics on Zwift are muted compared to outdoors. Much of this is due to Zwift’s drafting algorithm which makes precise pack positioning nearly impossible (ideas for improving the draft are shared above). But it’s also due to a lack of any team functionality in game. Teams most commonly use Discord to talk to each other during races, and it works quite well. That said, this is a third-party app with its own idiosyncrasies, and streamlining the racing experience is important. ZwiftHQ has talked about building voice chat into the game, and this would prove quite handy for team racing, as long as you could choose which Zwifters you want in your ears. 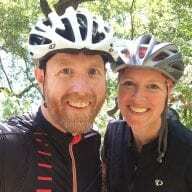 Another teamwork-encouraging feature would be some sort of “team powerups.” I recently chatted with Zwift Community Live host Nathan Guerra who shared several mind-bending team powerup ideas inspired from his time in other gaming environments. For example: what if a team could give teammates different roles (domestique, sprinter, leadout man, etc) then Zwift would deliver powerups based on those roles? A leadout man may receive a leadout powerup where, if that team’s sprinter is behind the leadout man, the sprinter receives the equivalent of the van powerup while the leadout man gets the aero helmet equivalent as a reward. Or if the domestique is working on the front on a climb and activates their domestique powerup, any team members behind them get the equivalent of the feather powerup. You get the idea. More advanced powerups that help teammates when used properly. Both the audio chat and team powerup features would require some sort of in-game team features where riders could join teams and enjoy a higher level of interaction with those teammates. The experience of Zwift racing differs greatly from outdoors, but this isn’t necessarily a bad thing. In creating its virtual world, Zwift has the opportunity to create a variety of race experiences… some which mimic outdoors, some which do not. 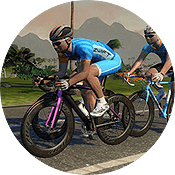 Additionally, there are clearly many tweaks which could be made to make Zwift racing more animated and strategic for individuals and teams. Many of these changes are already in the works at ZwiftHQ, and it’s only a matter of time before we begin to see them in game. What parts of the Zwift racing experience could be improved, and how should it be done? Share your thoughts below! I’d love to see powerups given like primes in a crit. Something like the first three thru the arch get the aero, the rest get nothing. Or maybe first three get aero, feather, draft and remaining get +10. Good article and agree with most however I believe the statement that races are basically a TT very true. In particular in lower grades such as C grade where I occasionally race. There is on ebb and flow like IRL. Basically you start as hard as you can and try to hold on as long as you can. I’d like to see a tweak to the Categories, lighter riders are at a disadvantage until they hit the A category. Most of the races are on flat courses which favour heavier riders who can put out higher raw watts, and if there are hilly courses the w/kg cat limit equalizes any advantage lighter riders might have. There’s so much race data, they could easily find out what watt ranges win for each category and potentially work in a formula that also includes 1 min and 5 min power which could make it more competitive across all Categories which benefits everyone who isn’t Category A or A+. The A and A+ categories should be just straight up a virtual replication of how they would perform outdoors. Categories were changed on ZwiftPower recently to include a minimum FTP in watts… for this very reason. For instance, a B rider has to be over 3.2w/kg AND 200w for their FTP. Regarding draft feel: that’s already there. On a smart trainer, you can feel when you are in the draft behind someone, as it requires a few less watts to stay in someone’s wheel. Often, in a pack, riders will be 0.2 to 0.4 watts less than the person pushing the pace at the front. No–there’s a draft EFFECT, but not a draft “feel” at this time. You don’t get a resistance change while drafting. Imo zwift should add environment effects like wind direction, max corner speeds based on weather, auto braking based on rider weight. Drop power ups more often so less likely to be held to end. Love the idea of grippy tires power up and effort based power up drop or maybe just drop them every 5min. My 5 cents about drafting: the most frustrating thing in Zwift racing is when you push hard and gap a group of riders on a climb (let’s say get a gap of 5-7 seconds) but then they overtake you on a descent. And not JUST overtake but overtake with such speed that you have to push hard again in order to jump into their pack. How about an accelerating fence at the start of races. The double draft does make pack speeds super fast. The blob just hammers along! It makes any attack in a race near impossible to stick. Even a small group of team mates attacking off the front has little chance of staying away from a big pack. I’d love to see more team tactics. I don’t want to be bothered with steering. RGT has auto braking into corners and more technical draft dynamics, CVRCade has wind and the possibility of crashing. Zwift could take the basic gist of these features and execute them in a much more polished form. As long as these extra features were just for racing (wind, auto braking, corner speeds, etc) that’d be fine – not sure they’d be much chop for general Zwifting or group rides. There is already a slow corner in Zwift, the hairpin at the top of Constitution Hill. But I agree that it would be a great addition to all corners in the game, maybe not for regular riding but certainly for racing. Fixed blob dynamics, resistance reduction in peloton, auto-braking and different cornering speeds for groups depending on it size (solo rider the fastest – big peloton the slowest) would revolutionize Zwift. I agree with michwoz, but will add that the existing auto-braking feature probably contributes to the speed of the peloton. Everyone is always pedaling because if you coast you actually slow to a stop. I am guessing that Zwift has this feature to avoid runaway bikes, but there has to be a better way. You should be able to coast on a flat without braking. Perhaps you could have the auto brake only kick in below a certain speed. With real coasting, you could possibly have more successful attacks because you would be able to have a more meaningful rest/recovery period prior to attacking. Right now you have to put down a enormous effort after hammering along with the peloton. Then there is nothing left to sustain the attack. Be careful what you wish for as most of these suggestions are likely to have unintended consequences. I struggle to understand how adding randomness is a positive feature. Racing in Zwift (if riders are honest about their weight and height and are using a correctly calibrated power meter or trainer) is inherently fair. A rider’s finishing position is the result of their effort and tactics. No more, no less, and surely this is what we want ? I know I’d feel robbed if I lost positions because of some random element introduced to make the racing “more interesting”. A number of commenters above complain about getting in a break and then being caught by a group. Isn’t this how it often works out IRL ?! I see this as realistic – you have to be with some really strong riders to sustain a breakaway. I find a lot of my racing involves making judgements about whether I can sustain the pace of the group I’m riding with. Should I consider dropping back to a slower group behind to make sure I don’t blow up before the end of the race ? Do I feel strong enough to go with a group attempting to bridge across to the group up the road ? The way these questions play out is nuanced and complex. For example, in some races I’ve dropped off the back of a group because I knew I couldn’t keep up that pace to the end of the race, joined a following group, and then swept up the riders from the first group because it turned out that they couldn’t keep that pace going either. So, racing in Zwift is as much about the decisions and tactics as pace and power and this is the way racing works IRL. Many of the suggestions made above to “improve” Zwift racing will make it less dependent on the rider which seems like the wrong direction to take. I think adding too many random powerups is probably not the right way to go… I would focus more on how to make the race dynamics more “realistic and or tactical”. On the flip side do we really want to have a virtual flat tire in Zwift and have chase through the team cars to get back on? 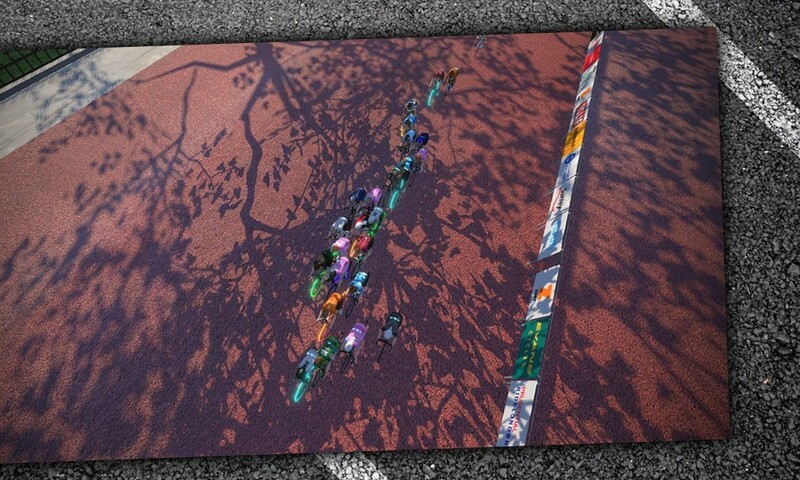 Maybe add a feature where you can call a team car and have a sticky bottle but do it too long or often and get penalized… I think that you should have to earn the powerups… Give people the option to “sprint” up to a Moto that is in front of the peloton and get moto paced for 30secs…. I think modifying the draft based on wind speed/direction could be interesting in races. I also like the idea of the trainer adding resistance when you pull on the front of a group, maybe even get progressively harder as you move closer to the front of the group… say 1st 1/4 of riders are getting 3/4 less draft than the last 1/4 of riders…Maybe add the option for a random crash that splits the group, again give you incentive to be up front where it is harder but safer. I don’t know about the steering thing (that’s would be confusing if you have to mess with some device or a keyboard during a race). But I am tired of being thrown out of the pack draft in turns or shoved out by other riders and having to fight my way back in. Zwift needs to figure out how to keep riders in the pack together instead of weirdly scattering in turns and other situations. As for power ups, it’s a love/hate relationship — I love them when I get the right one (like the aero helmet for a sprint finish), but there are so many times I get nothing but + points and have to watch five or six other riders hit their power ups on the home stretch and it’s all I can do to just hang on a wheel. Personally, I’d like to see them gone. In a close race it comes down to the luck of the draw, who’s got the aero or feather, that sneaks across the line a 10th of a second ahead of you. Another way to earn power ups is Race Primes where riders are give higher strength power ups based on placing that they can use themselves or give to a teammate to use.